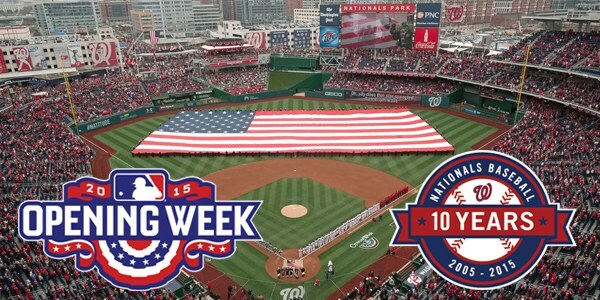 Nats 2016 Opening day Payroll: $145,178,886 according to Cots. This is down nearly $20M from last year’s figure. We can only hope that Mike Rizzo will be allowed to “spend” that money later in the year at the trade deadline if this team actually needs to spend money to acquire helpful players. My personal payroll estimate came in at $ $137,286,029 coincidentally; why am I $8M off? Because Cots basically makes arbitrary proclamations of salary for current year when money is deferred whereas I’m counting it as real dollars. So for example I’m charging the Nats payroll precisely $15M for Max Scherzer this year while Cots puts the figure north of $22M, and Cots puts all of Papelbon’s $3M deferred 2016 salary on the 2016 books. So between those two players the entire delta is accounted for. The question is this: as a Nats fan are you “happy” that your payroll is down nearly $20M in Stephen Strasburg‘s walk year and while your Season Ticket prices continue to rise? USAToday also publishes opening day salaries for teams and i’m convinced that they’re garbage. I’ve got a comparison spreadsheet where i’ve put the USAtoday figures side-by-side with Cots’ analysis and for some teams they’re off by more than $25M. The problem is that USAToday doesn’t count ANY payments handed to and from between teams, whereas Cots does a very detailed auditing of such money. 2008: 39,389 (season and stadium opener), 8pm sunday night, Braves, nat’l tv clear but cold. 2005: 45,596 (in rfk, debut of entire franchise, 62degr and clear, evening game). Nats park capacity for 2015 seems to still be 41,456 unless they announce an 2016 adjustment. 2015’s opening day crowd wasn’t even close to 2013’s: 45,274. That remains the regular season record attendance. All time record attendance? The ill-fated 2012 NLDS game 5: 45,966. The first game in franchise history; 2005 in RFK: 45,596, which stood until the NLDS record-setting game. The long-running regular season attendance record was the great Fathers day 2006 game in RFK against the Yankees: 45,157. That record stood for more than 6 years. 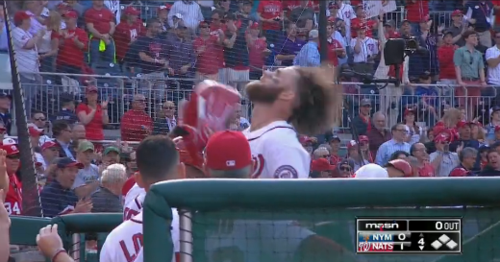 Nats are just 4-8 in their home openers now since moving to Washington. Just one guy has thrown more than one home opener for the Nats: Livan Hernandez. When Livan gets elected to Cooperstown, I hope he’s wearing the curly W.
2016: mlb.com: Marlins d Nats 6-4. WP: David Phelps, LP Tanner Roark (Starters: Brian Conley and Roark). Record: 5-7. # times home/away: 6 home, 6 away. The Nats managed to lose 6 of their first 7 season openers … only winning in 2008 when debuting their new stadium. And Jon Rauch did his darndest to blow that opener too, coughing up the lead in the 9th to give Ryan Zimmerman a chance at glory. Leader in Opening day starts: remains C.C. Sabathia with 11, though he’s missed the last two years. Leader in consecutive opening day starts: Felix Hernandez, making his 8th consecutive, 9th overall. Justin Verlander returned to Opening Day duties, getting his 8th career opening day start; he remains in 3rd place actively. For the Nats; Max Scherzer gets his 2nd and Stephen Strasburg continues to have three. Ten (10) pitchers made their first opening day start in 2016. The most ever? Tom Seaver with 16. The most consecutive? Jack Morris with 14. MLB Trade Deadline 2015: who improved their rotation the most? It was by most accounts the busiest trade deadline ever. Lots of high impact players moved. And we were worried that the 2nd wild card would curtail the trade market! Here’s a couple of good summary links: a division-by-division overview of teams post-deadline, BaseballAmerica.com’s Trade Central, with a review of every 2015 trade, and a nice trade-by-trade grade at Minorleagueball.com. 1. Los Angeles: added Mat Latos and Alex Wood, replacing two placeholders who had taken over for the injured Brandon McCarthy and Hyun-Jin Ryu. Add Latos and Wood to what the Dodgers were already rolling out and I feel like they have become the new team to beat in the NL. 2. 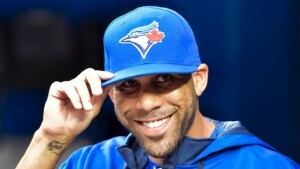 Toronto: adds the best pitcher on the market David Price to a team that really, really needed a bump in their pitching. Price is used to the AL East and gives Toronto (coupled with their big Troy Tulowitzki move) a leg up on their divisional rivals. The rest of the division mostly stood pat in terms of the trade deadline, and the division is there for the taking. I believe Toronto can catch the Yankees; they’ve been incredibly unlucky by RS/RA and should regress upwards. 3. Kansas City: Johnny Cueto immediately replaces the injured Jason Vargas in a “nice timing” move, and KC solidifies its grip on the division. This move wasn’t about getting to the post season as much as it was about winning once they get there. Cueto is their 2015 version of James Shields; the workhorse who they can lean on in the 5- and 7-game series. 4. 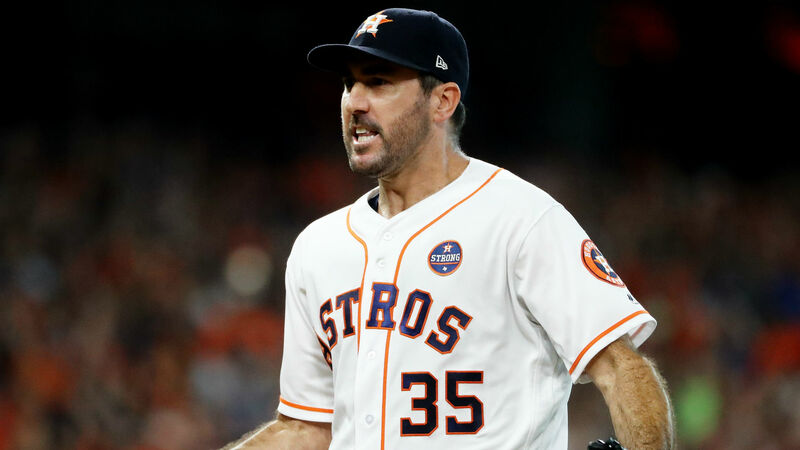 Houston: added Scott Kazmir and Mike Fiers, who will slide in to the 4th and 5th spots and supplant the under performing Scott Feldman and others who need more time in AAA. While not as flashy as some other teams’ moves, this makes the back of Houston’s rotation stronger. And, it should be noted, Houston’s main AL West rival (Los Angeles) not only didn’t make a move but just lost one its key starters to injury (C.J. Wilson). Houston’s rebuilding plan looks like its at least a year ahead of schedule and coupled with serious injury issues to their competitors look like the favorite in the AL West. 5. Texas: adds Cole Hamels, who Philadelphia *finally* moved after sitting on the pot for 2 years. I think this move is more about 2016; I don’t really see Texas making a move in 2015. But it is a significant move: Hamels could give Texas one of the best AL 1-2 punches when Yu Darvish comes back, and then they have a nice collection of arms to choose from to fill out the rotation (Gallardo, Holland, Perez, Lewis, Martinez). 6. San Francisco adds the underrated Mike Leake, who slides into the #3 spot, prevents the Giants from even considering using Tim Lincecum in the rotation any longer, and certainly gives them an upgrade over what they were getting from Tim Hudson. SF isn’t *that* far back from LA in the division … but more importantly is working hard to secure a WC spot. 7. Pittsburgh makes a minor move in adding J.A. Happ, who slides nicely and fortuitously into the spot that A.J. Burnett may be giving up to injury. 8. Chicago Cubs curiously added Dan Haren to their rotation; adding a mediocre #5 starter to a team that plays in a hitter’s park may back fire. I would have thought Chicago would have been more aggressive to try to secure the 2nd wild card, but then again is it fair to say their rebuilding plan is also a year ahead of schedule right now? Maybe they go big in the off-season to add starters behind Lester/Arrieta. – Detroit moved backwards, selling their ace but acquiring a good prospect in Daniel Norris. This move also lets them try out a couple of starter prospects for the rest of a season where they’re clearly not going to catch Kansas City. 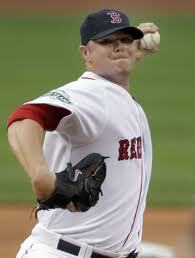 – Oakland was a seller but didn’t augment their rotation very much, getting a #5 starter in Aaron Brooks. Oakland has been completely snake-bit this season, sporting one of the best run differentials in the game but having lost 75% of the one-run games they’ve played. Billy Beane isn’t afraid to deal though and he’s got more than enough starting pitching coming off injury to compete in 2016. – Philadelphia got the rotting corpse of Matt Harrison in return for Hamel, along with a whole slew of players; I doubt Harrison ever pitches for them. – Cincinnati sold off their two best pitchers and now are doing open auditions at the MLB level for their 2016 rotation. – Miami finds themselves in a familiar place, selling off assets so as to line the pockets of their owners needlessly. They lose two rotation guys but augment from the D/L and the farm system. They’ll regroup for 2016 and continue to challenge as the worst organization to their fan base. – Seattle was sort of a seller, flipping off back of the rotation guys for spare parts. They did not meaningfully alter their core rotation. Their problem is simply under-performance. – Atlanta curiously parted with one of the most valuable resources in the game; the effective MLB-minimum starter. They ended up with draft picks and prospects and a Cuban wild card in Hector Olivera. – Milwaukee parted with a 5th starter, giving those starts to their #1 prospect Taylor Jungmann. A good deal for them. Every year I try to attend Nats Opening Day. Since giving up our season tickets, we’ve had to pay (handsomely) for the opportunity, and yesterday was no exception. For nostalga purposes, we bought into our old section (131) for the home opener and had a great time in the sun. Too bad Ian Desmond had money on the game and enabled three unearned runs to score. Oh and our first pinch hitter off the bench? The powerful and feared Matt den Dekker. So yeah, this team looks like it may struggle offensively for a bit. Here’s some fun stuff that I have been tracking for years inre opening day. Counting payroll is always a tough one. I have a payroll tracking worksheet (now updated for our last three NRI additions and our opening day roster) where I have been trying to estimate the Nats payroll. Why the discrepancies? I can’t quite figure out how my and Cot’s estimates are off: I’m counting the $2M option year buyout to Adam LaRoche, while Cots does not. Taking that out, i’d still be off by about the same amount, only to the wrong side. My guess is that Cots is missing a min-salary guy somewhere. Meanwhile USA Today’s estimate is counting the entirety of Dan Uggla‘s 2015 salary of $13.5M towards Washington’s total; If you took that away except for the MLB min portion Washington is responsible for you’d be at $161,518,497 as their estimate. USA Today’s numbers also don’t take into account the nearly $40 million dollars (net) that the Dodgers are paying players who no longer play for them; their payroll (per USA Today’s estimates) should really be nearer the $270M range. You know what they say; a few million here, a few million there, and soon you’re talking about real money. Here’s a quickie little XLS where I have the opening day payroll for all 30 teams going back 5 years. Caveat; I usually depend on the USAToday salary database for these numbers, which have proved to have some issues (as discussed above). USAToday has the Dodgers at $230M, but that’s before another $40M of payments to former players. Cots has the Dodgers at $271M, a more accurate figure. That’s first place by a significant margin. In second place is the Yankees: $213M-$217M for a team that many feel will come in last last place. I’m going to update this XLS for Cot’s figures, since USAToday’s are just so bad. Leader in Opening day starts who extended their total in 2015: Felix Hernandez, making his 8th. Leader in consecutive opening day starts: also Hernandez, making his 7th total (he missed one earlier in his career). Four pitchers now have 7 opening day starts on their resume: Bartolo Colon, Jered Weaver, James Shields and Justin Verlander. Verlander’s streak of 7 consecutive starts was broken when he was supplanted by David Price for 2015. Of these four, it seems likely only that Shields will continue. 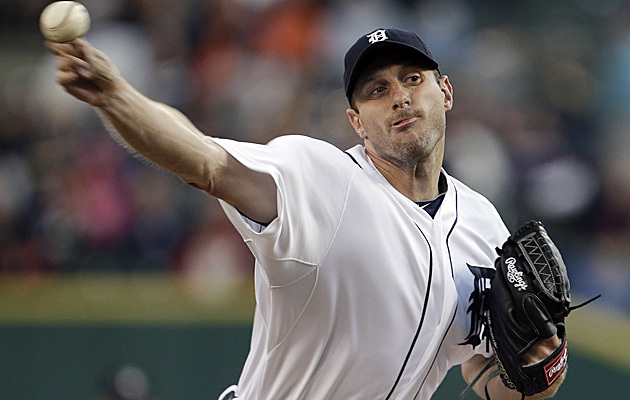 12 pitchers made their first opening day start in 2015, including our own Max Scherzer. Last year we did a quick analysis of all the Qualifying Offer-receiving free agents to see if the system was “working.” (note; from here out I’ll use the abbreviation of QO for Qualifying Offer). Now that James Shields has signed, there remain no more free agents on the market who received a QO from their former team. Lets take a look at how the qualifying offers affected the markets for those players who got them this off-season. It should be noted that for the third consecutive year, not one player who received a QO accepted it despite its ever increasing value ($15.3M for 2015). Is this “reverse collusion” on the part of the players, not to play the QO game? For the third year, there were players about whom pundits scratched their heads as to why they chose not to take the offer. While not as obvious as in 2013 (when both Stephen Drew and Kendrys Morales vastly over-stated the market for their services and were severely penalized as a result), the fact that especially Michael Cuddyer and David Robertson didn’t take the QO remained puzzling. So, among the 12 players, who was hurt? In the end, nobody really. Half the players got new contracts with AAVs above the QO figure, in some cases significantly above. So they’re not being “hurt” by the system. This list includes Russell Martin, Victor Martinez, Hanley Ramirez, Pablo Sandoval, James Shields and of course our own Max Scherzer. Another 3 players (Melky Cabrera, Nelson Cruz and Ervin Santana) signed longer term deals for slightly less than the AAV of $15.3M. I say these guys were “not really” hurt since they guaranteed themselves 3-4 years and in each case nearly or more than $50M of earnings. Each player rightly gambled and guaranteed themselves $50M instead of $15M. The remaining three players each kind of have extenuating circumstances. Francisco Liriano declined the QO and then re-signed with the same team (Pittsburgh). He got a 3yr deal for $39M. Most pundits would agree that nobody would have given Liriano a $15M/yr longer term deal thanks to his age and injury history, so his taking lesser money AAV but for longer is a smart move for him. Perhaps the QO limited his market, forcing him to go back to Pittsburgh … or perhaps not. David Robertson declined the QO but got a 4yr guaranteed deal for $46M … as a reliever. Which is fantastic, considering the volatility of the reliever position in general. So even though his AAV is far less than $15.3M, he made out big time with the amount of guaranteed money. San Diego gives up the best draft pick (13th overall) to get Shields’ services for four years, but five teams altogether give up first round picks to sign players. Boston gives up its two second round picks to play Ramirez and Sandoval on the right side of their infield for the next four years. A number of very wealthy teams pick up supplemental first round picks (Dodgers, Yankees and Detroit), which (like all FA compensation) kind of seems to defeat the purpose of helping “poorer” teams off-set the loss of marquee players. Lastly, the order (and pools) for the 2015 draft is now set. A better look is here, showing all the picks gained and lost. Houston has the 2nd, 5th and 37th overall picks, 12 picks in the top 10 rounds and has an astounding $17M of bonus money to acquire players. Washington has just $4.1M to sign its first 10 picks, meaning we’re likely looking at another set of college seniors drafted in rounds 6-10. More on the draft later on. So, to answer the question of the day; are QOs working? This year they seemed to have worked; you can’t really argue that any player was negatively affected and teams that lost players got compensation picks. You can argue whether the right teams got these picks. Scherzer is on everyone’s mind. Photo via Scherzer’s twitter account. Love it; another inbox to analyze. In the wake of the Scherzer signing, lets see what kind of questions MLB.com beat reporter Bill Ladson fielded this week. As always, I answer as I write before reading Ladson’s answer, and edit questions for clarity as needed. Q: How much better will the Nationals be now that right-hander Max Scherzer is on the roster? A: Well, if you play the “WAR analysis” game, then Max Scherzer replaces Tanner Roark in the rotation for 2015. Scherzer posted a bWAR of 5.5 in 2014 while Roark posted a bWAR of 4.8. So on the face of it, assuming that both players provide identical value in 2015 as they did in 2014, perhaps Scherzer won’t immediately impact the team. This is the essence of those immediate-post signing blogs and columns that questioned why the Nats needed to make this acquisition. However. I offer some counters. Roark immediately becomes your spot-starter to cover for injury. Lets say that Gio Gonzalez (bWAR in 2014 of just 2.1) gets hurt and Roark covers for him; well that’s nearly a 3-WAR improvement. Certainly Roark is going to be better than whatever AAA cover we could promote to provide injury relief. The Nats only gave 12 13 starts to non-core rotation guys in 2014 but more than twice that number in 2013; the odds are that an injury is going to hit the rotation at some point. Scherzer will be better in 2015 than he was in 2014. Why? He moves to the NL, gets to face pitchers instead of DHs, faces generally weaker lineups, plays in a weaker division and pitches in more parks that are pitcher friendly. You can make the argument that his K/9 is going to increase significantly (if he faces the pitcher 60-70 times in a season, he likely strikes them out at least half of that), and his ERA likely falls at least a half a point. That will boost his WAR for 2015. Scherzer going twice in a seven game playoff series is going to be better than having any one else getting that second start. In fact, a 1-2-3 punch of Strasburg, Zimmermann and Scherzer is one heck of a daunting task for any opponent. And there’s this: not to completely re-hash my post on the Scherzer signing, but i’ll note that this signing (to me) seems like a way to bridge the gap and guarantee an “Ace” in the rotation through the next two off-seasons of rotation transition (where the team likely loses Zimmermann, Fister and Strasburg). The Nats rotation looks an awful lot better after these three guys are gone if Scherzer is leading the line. So to me this isn’t a move about 2015 as much as it is about getting this team to 2017 and maintaining competitiveness. Ladson said very little about answer the question, using his answer to immediately talk about the offense and the bench. Yeah we know there’s issues there. And we all remember how the middle of the order went like 1-for-the NLDS. Wasn’t the question. Q: Why didn’t Espinosa work on hitting right-handed exclusively after the season ended? If Espinosa made that transition successfully, he would be the answer at second base. Espinosa may be getting “advice” from his agent (Scott Boras) to put his own interests first. Espinosa may be “stubborn” about maintaining his switch hitting, given that it is a differentiator in the marketplace for him. Espinsoa may just be uneasy about suddenly facing right-handed curve balls from the right-hand side, probably having not faced such a situation in more than a decade (a fair point). We all know about his splits lefty versus righty. We all know he has not chosen to try RH-only. I think its also safe to say that the organization has gone out of its way (Asdrubal Cabrera last season and now Yunel Escobar) to replace him in the starting lineup despite his defensive skills. It is what it is; we now have a backup infielder on the roster to cover both 2B and SS and who has some pop from the plate in a backup capacity (and the associated K-rate of course). Not the worst thing in the world to have. Ladson says … well he stated the obvious (Escobar is the starter) and then says that the “Nats hope Espinosa cuts down on his strike-outs.” Non-answer. Q: How come Jeff Kobernus is not being considered for the starting second-base job? Why not have a young, cost-controlled guy play every day? A: Because Kobernus hasn’t played 2B basically since college full-time since a half-season stint in Harrisburg in 2012. The team moved him to the OF and he’s mostly stayed there. Even if you thought he could play second effectively, he’s got a career minor league slash line of .285/.331/.363. He is what he is: a utility guy who can cover in case of a slew of injuries and makes for a good 9/1 pinch running/6th outfielder call-up, but that’s about it. I don’t think you can count on him to produce at the major league level day-in and day-out. Ladson says Kobernus has a chance of making the bench out of spring training this year, which I disagree with. Q: Asdrubal Cabrera signed with the Rays for one-year, $7.5 million. Why couldn’t the Nats make that deal? Or something close to it? A: Probably because Cabrera wanted to play short-stop, and the Nats have a short-stop. Besides, Escobar at $5M is a good deal. I mentioned at some point in the off-season that Cabrera’s offensive output with Washington wasn’t too much better than Espinosa’s frankly (Cabrera’s split line with Washington in 2014 was .229/.312/.389; Escobar brings more to the table. Ladson agrees, and says that the Nats weren’t willing to bring Cabrera back at his asking price based on what he showed last year. Q: Why didn’t the Nats consider Tyler Clippard as their closer? A: Hmm. Good question. Perhaps because when Clippard was given the closer job in 2012, he really struggled with it as compared to his typical 8th inning performance. ERA in 2012 as closer: 3.72. Career ERA: 2.88. Besides, there was more in play for Clippard’s trade than just who was going to be the 2015 closer. Clippard’s got a ton of miles on his arm, Clippard was set to make nearly 8 figures as a reliever, and the Nats felt like they could afford to part ways with him to acquire a player who filled a need. Ladson notes what I noted, and said that Clippard’s pending free agency played into the decision. That’s a great point that I didn’t mention; Clippard wasn’t going to be offered a qualifying offer (likely worth $16M next off-season), so he’d depart to no compensation. With this trade, the Nats got some compensation for him. Q: I know he’s had plenty of success as a general manager, but I’m surprised Mike Rizzo doesn’t feel any sense of urgency to try to sign Desmond or Jordan Zimmermann to an extension. What are your thoughts on this? A: I think Mike Rizzo has been trying to extend these guys for more than two years. “Sense of urgency?” What else do you want to ask of the guy? He by all accounts has offered both guys 9-figure deals, and has been rebuffed. Do you think Ian Desmond is worth a 7yr/$100M deal? 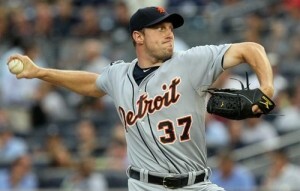 Do you think Zimmermann is worth a 6yr/$150M deal? Clearly to me the two players are valuing themselves higher than what the GM is valuing them, the GM has made what he thinks to be fair market value deals, and both guys have opted to test the market. Baseball is a business, both on the player side and the team side. Ladson thinks Rizzo will step up discussions once spring training happens. I don’t; I think that the ship has more or less sailed on extending these guys at this point. Now, will the team move Zimmermann? I think we may see offers once James Shields signs…. if there’s teams out there that want to improve but miss out on Shields, they may come calling to the Nats with deals we cannot turn down. We’ll see. Overall thougth I’m doubtful any trades occur at this point. My prediction: the juggernaut rotation goes into 2015 in-tact. Washington-San Francisco: predict a Washington 3-1 series win. Actual: SF wins 3-1. St. Louis-Los Angeles Dodgers: predicted a LA sweep or 3-1 series win. Actual: StL wins 3-1. Detroit-Baltimore: predicted a Detroit sweep or a 3-1 win. Actual: Baltimore sweeps 3-0. Kansas City-Los Angeles Angels: predicted a LA victory in 5. Actual: Kansas City sweeps 3-0. San Francisco- St. Louis: predicted St. Louis in 7. Actual: San Francisco walks off 4-1. Baltimore-Kansas City: predicted Baltimore in 6: Actual, Kansas City sweeps 4-0. Bumgarner has now thrown 31 post season innings so far in 2014. He’s given up 19 hits, 5 walks, and just 5 earned runs in that time (3 last night, 2 more against the Nats). Shields, despite his moniker of “big game,” has not been solid this post season, giving up 10 runs in 16 innings. Ventura has one good outing and one mediocre outing. Peavy has been on a very short leash (thanks to the presence of two reliable long-men in the Giant’s pen in Yusmeiro Petit and Tim Lincecum) but has given decent performances. Advantage Giants in pitching in the first two games; I’ll go with a 1-1 split in KC. Back in SF, Hudson and Vogelsong both were dominant against the Nats, but not so much against the Cards. I have a feeling the Royals are going to hit them. I’ll predict that the Giants take 2 of 3 in SF, sending the Royals back to KC down 3-2. From there, Its hard to argue against the run the Royals are on, and they’ll have home field plus be done with Bumgarner. Royals ride their wave of good fortune in beating “better” teams and take the series. Prediction: Royals in 7. Just a note: are you troubled by the fact that both wild cards are in the world series? 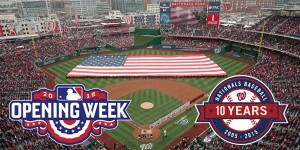 Or that the teams with the best records (Nats and Angels) were both (rather easily) defeated in the divisional series? Shields-Myers trade revisited; not such a bad deal now, eh? How does the Myers/Shields trade look a year later? Prospect-followers (like me) howled about the trade at the time. Wil Myers was the consensus “best prospect in the game” at the time while Shields wasn’t exactly considered to be an “Ace” in the league. Royal’s GM Dayton Moore was accused of playing short-term gains versus the long term health of his franchise because of perceived pressure to return to the playoffs for the first time in nearly 3 decades. Myers subsequently turned around and won the AL Rookie of the Year in 2013 while the Royals improved but still fell short of the playoffs. I freely admit it: I hated the deal and thought it was another example of the Rays fleecing another team in a trade. I wonder now if it is because I undervalued what Shields brings to the table. I wonder if we all do: compare what Tampa got for Shields versus what they got for David Price; if the Myers deal had been for Price instead of Shields, I wonder if anyone would have howled a bit, since Price was a “name” player with awards while Shields was and is a relatively “anonymous” player in what he accomplishes on a day to day basis. Two seasons onward, with the Royals having broken through to the playoffs, lets take a look at the players involved. Shields: Just finished his second 225+ inning season leading the Royals staff, putting up bWAR figures of 4.1 and 3.3. Shields also made the start (thought he didn’t really factor in the decision) that put the Royals into the ALDS for the first time since 1985. He went 6ip/2ER to earn the win in the ALDS series clincher over the Angels, and is scheduled to start the ALCS opener tonight. Davis: failed as a starter in 2013, but became one of the best setup men in the game in 2014. Numbers: 71 innings, a 1.00 ERA, a sub 1.00 whip and a 3.7 bWAR. That’s a pretty big WAR figure for a reliever. 2014 bWAR for the Royals’ side of the trade: 7.0 between them. How about on the Rays’ side? Myers had a 2014 slash line of just .222/.294/.320 in 87 games and missed half the year with a broken wrist. bWAR of -0.9. Montgomery just finished his second full year in the AAA rotation, going 10-5 with a 4.29 ERA in Durham. He has yet to appear in the majors. He’s also just finished his 7th minor league season, which means he’ll be a MLFA if he’s DFA’d by the club (he’s on the 40-man roster; I’m not sure how many options he has left). Leonard had a .808 OPS+ as a 21 year old in high A. He’s likely 2 more years away from a MLB debut. 2014 bWAR for Rays side of the trade: 0.3. Devil’s advocate statement: It is just one season. Shields is a FA once the playoffs are over while the Rays control all four guys for years to come. But “flags fly forever” and the Royals did finally achieve their goal of making the playoffs. And they continue in the playoffs while Tampa continues to play golf. Two years onward, would you still make this trade? Would you sacrifice the long term promise of Myers and Odorizzi for the short term glory of a playoff run? Editor’s Update: this article was originally published in Oct 2014. In mid December, 2014, Tampa, San Diego and Washington were involved in a huge 11-player 3-team trade where Myers was moved to San Diego. The return Tampa got for Myers was, to be honest, kind of thin frankly. The Padres sent 5 players to Tampa (a backup catcher and four prospects) to acquire Myers and others, and then Tampa turned around the two best prospects in the deal to the Nats for Steven Souza and Travis Ott. Did the Rays trade away a problem child? Was Myers over-hyped? Did he win his Rookie of the Year award thanks to an inflated BABIP and in actuality he’s a lot closer to replacement level than many thought? Per the article, the answer to all of those questions may be “yeah, maybe.” But inarguably this recent Myers trade if anything makes the Sheilds trade that much closer of a “win” on the KC side of this original deal. Had I published in time, I likely would have gotten at least one of the WC games wrong too (I liked Bumgarner but thought Francisco Liriano could revert to his dominant 2013 post season form). Four predictions, four incorrect, mostly wildly so. Damn. So much for the “pitching wins in the postseason” narrative. SF barely hit against Washington’s starters but still squeaked out 3 games from 4. St. Louis on the other hand hits the ball a ton and should pound SF’s lesser starters. I like a split in Stl thanks to Bumgarner, then Stl taking two of three in ATT, and SF liking their chances throwing their ace in game 6. But who the heck knows what is going to happen; Wainwright gave up 11 hits in his last outing. St. Louis in 7. I, and every other national pundit, continue to be underwhelmed by Baltimore’s pitching staff. But they get the job done: Norris was un-hittable against Detroit, and Tillman pitched good enough to win. Is KC on a mission to save Dayton Moore’s job? It sure seems so. They couldn’t surpass Detroit in the regular season but swept the best team in baseball in the ALDS. But meanwhile, Baltimore *hits* the ball. I think Baltimore could win both games at home to start and then two of three in KC.